WIND-WORKS: Was Anderson Indiana a Part of Wind Industry History? I don’t have a good answer to that question. All I know is that I stumbled a cross a faded newspaper clipping at the Madison County Historical Society that pictured a wind turbine that I’d never seen before. Not only was it an unknown wind turbine—to me certainly—but that I’d never seen reference to it or its inventor Charles E. Miller before. The clipping showed a large four-blade turbine that looked fairly sophisticated for the 1920s and 1930s. I didn’t keep the clipping in hopes of tracking down the original photo from surviving family members. Alas, that wasn’t to be. There’s only a brief mention in Wind Charger Hall of Fame 1916-1956 and Patent 2,037,528 for a WIND MOTOR filed July 30, 1934 by Charles E. Miller. And there’s the odd reference in from the July 8, 1958 edition of the Anderson Daily Bulletin that “Charles E. Miller erected a windmill generator on top of his manufacturing plant at 14th and Main Streets 'to generate electricity for use in lighting the Miller plant.” This was dated 1933. What makes this so intriguing is not only was this in my backyard so to speak—I was raised near Anderson in central Indiana and worked there in my early adulthood—but that Anderson was a part of aviation experimentation. Anderson is famous in the automotive industry. There were dozens of car companies there during the industry’s formative years. Some of these companies were quite innovative, though all but forgotten today. It was also the home of Remy Electric that evolved into General Motors Delco-Remy Division, one of the world’s largest manufacturers of automotive electrical components. What I learned on a trip to the Historical Society in mid-2015 was that there was also aeronautical experimentation in Anderson as well. It makes sense when you think about it. There were a lot of companies building internal-combustion engines in the city and it was the gasoline-powered engine that made aviation possible. At a lecture, the Society’s curator showed a photo of an airplane built in Anderson that sported a striking airfoil. This wasn’t some half-baked idea. According to the curator, the plane flew over Anderson, landed, and was never heard from again. Miller was an inventor and industrialist. The clipping of one of his windmills was part of an exhibit at the Society on the products his factory made, including rubber tires for automobiles. 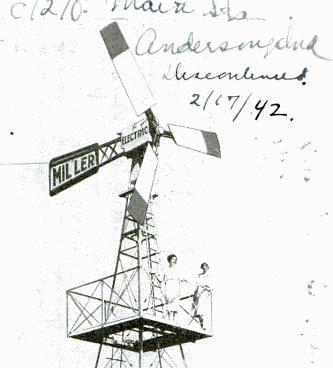 The family has references to Miller installing what sounds like a conventional multiblade windmill on his estate in 1926. That must have proved unsatisfactory because he later moved to a rotor using three airfoils with a tail vane to keep the rotor upwind. I found one image of this approach on line. The family says there is a photo of the three-blade wind turbine mounted on the roof of the tire plant. They also mention a four-blade turbine that was also installed at the estate, Miller Hills. The promotional material found online makes clear that Miller was targeting a rural market for home light plants, especially dairies that were not served by central station power. This was the same market that made Jacobs Wind Electric and Windcharger famous. This is the extent of what I know. If there’s mill historian out there who knows more, please get in touch. While researching my latest book I re-encountered a number of early inventors I’d forgotten about and I came across significant contributions from a number I never knew existed. Charles E. Miller may be another. For more on Miller, see Charles Miller’s Four Blade Turbine of 1926: Indiana's Contribution to Wind Energy History.